The Toronto Raptors selected forward Andrea Bargnani with the top overall pick in the 2006 NBA Draft. Bargnani came to the NBA after spending time as a professional in Italy. The seven-footer appeared in 65 games in his rookie season, averaging 11 points and just under four rebounds per game. Bargnani spent the first seven years of his career in Toronto before being dealt to the New York Knicks in 2013. With the second overall pick in the 2006 NBA Draft, the Chicago Bulls selected future All-Star forward LaMarcus Aldridge, who was later dealt to the Portland Trail Blazers for the fourth overall pick, forward Tyrus Thomas. At number three, the Charlotte Bobcats picked Gonzaga forward Adam Morrison. The Atlanta Hawks rounded out the top five with the selection of Duke forward Shelden Williams. The most notable player drafted outside of the top 10 in the first round of the 2007 NBA Draft is guard Rajon Rondo, who was selected by the Phoenix Suns but was later shipped to the Boston Celtics. 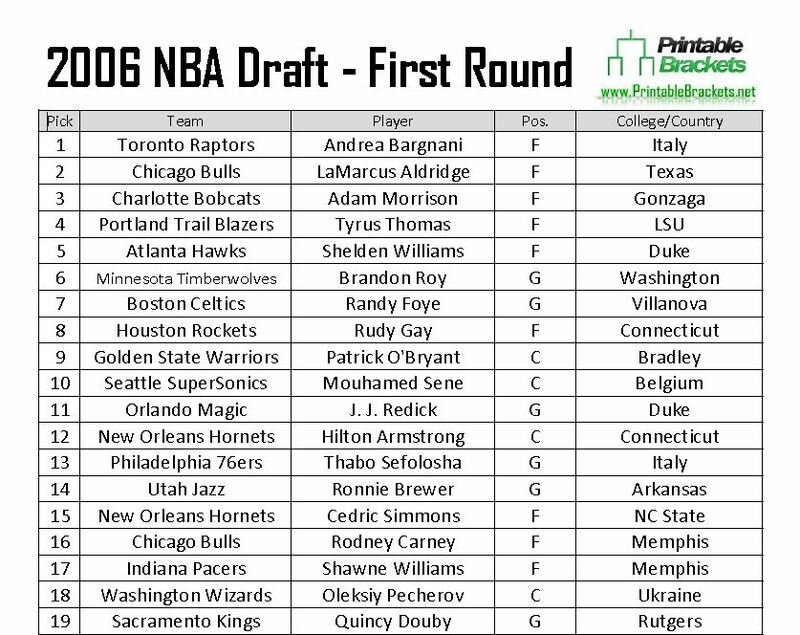 Other notable players selected in the first round of the 2006 NBA Draft include J.J. Redick, Thabo Sefolosha, Ronnie Brewer, Shannon Brown, Jordan Farmar and Kyle Lowry. Brandon Roy, who was selected by the Timberwolves but traded to the Trail Blazers, was named the Rookie of the Year for the 2006-07 season. Roy, Bargnani, Foye, Gay, Aldridge and Jorge Garbajosa were named to the leagues All-Rookie Team. Notable players who went unselected in the 2006 NBA Draft include J.J. Barea, C.J. Watson and Lou Amudson.